Wow, I feel so blessed. This morning on my way out to work I checked the letter box and sitting there was a little box. Inside were these gorgeous beads. I am stunned at their beauty. I've yet to have a really good play with them, but plan on seeing what my mind comes up with tonight. Check out Doris, who these fabulous beads came from. And here is the entry where she shares the soup I sent her. Oh, I just love Doris and her work. What an incredibly cool soup she sent you. AWESOME! I am really glad, that my bead soup has arrived and that you like it. So you have enough time to do somethig with. Love it! I can't wait to see what you come up with for your design! 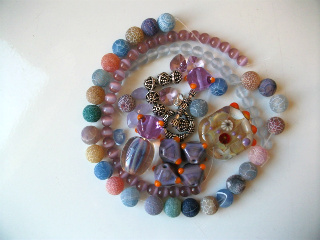 Beautiful color palette and beads! That's a great grouping of colors that I would probably never put together. Looks like a lot of fun. Very pretty soup! Looking forward to what you make with it!